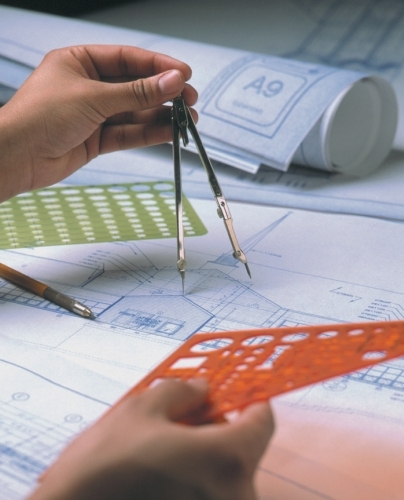 ABEC, headquartered near Philadelphia, provides building planning services and loans to American Baptist churches, helping them expand, renovate and become accessible and energy-efficient. 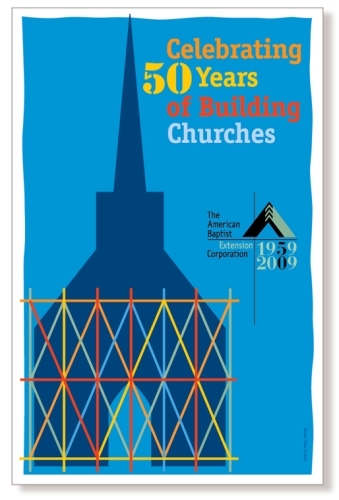 Based on a dovetail joint — the strongest bond in construction — the brandmark suggests praying hands and a church spire as well as the letter ‘A. Logo palette keeps brand identity consistent over a range of print and web applications. ABEC’s new website is designed in a custom WordPress template that the client can easily use to update information such as current loan rates and new investment products. 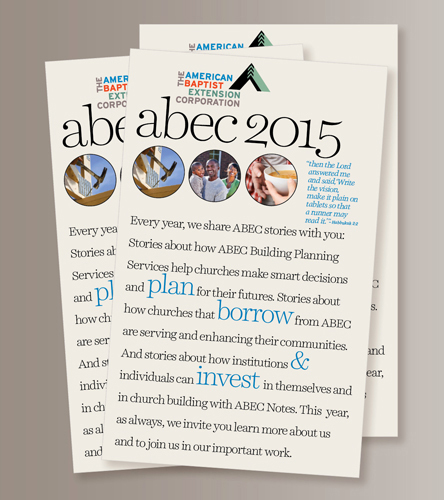 The 2015 annual report is a new, newsletter-style approach. 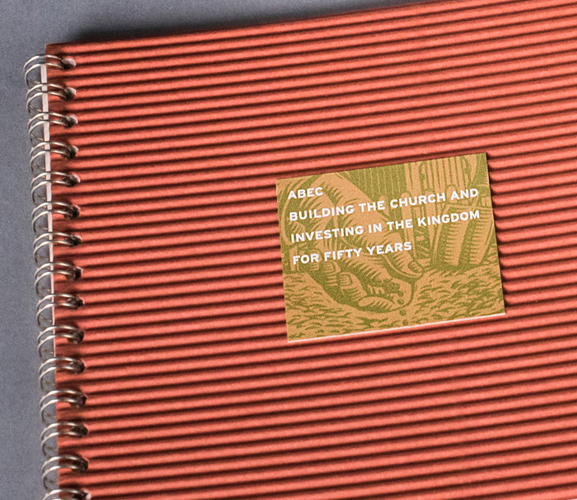 The 14 previous years of ABEC annual reports produced by Visual Language LLC were 24-page brochures that told longer stories of investors who’ve enjoyed consistent returns and of and churches that have been built and renovated to better serve their communities. 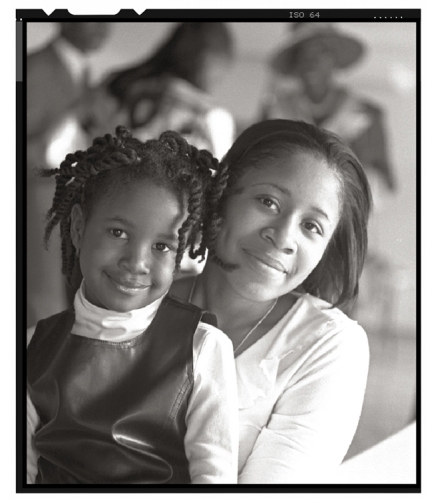 Annual report photography by John Bastian tells how an ABEC Loan helped Grace Tabernacle Baptist Church, Cleveland, build for its families and for the future. 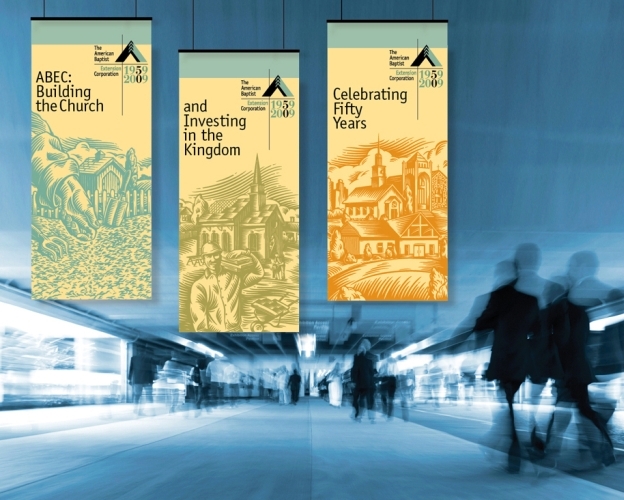 An anniversary version of the logo was applied throughout the 50th anniversary year, beginning with this poster. 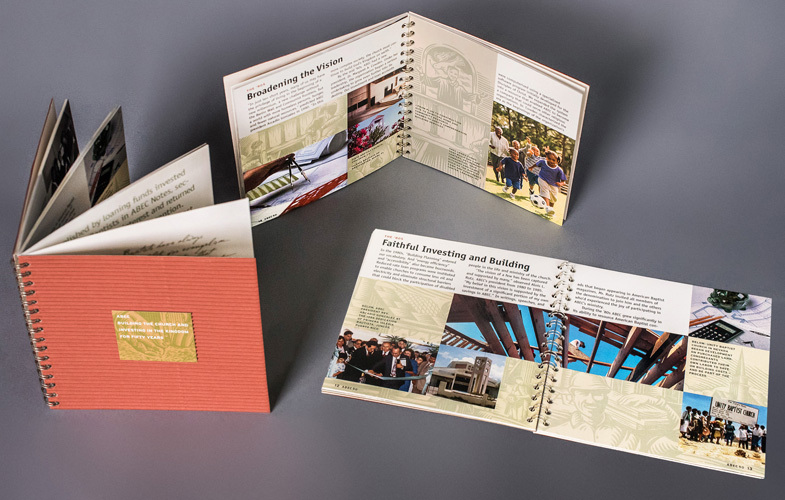 Digital woodcut illustrations by John Etheridge were featured in the history booklet, conference banners, ads, and the annual report. Still-life hotography by Peggy Barnett depicts the steps involved in planning, designing, and funding a new church using funds invested in ABEC Notes.